The store-bought version costs a very reasonable $20, but I knew I could make one for next to nothing. Which I did. Actually, I made two of them for $5.00. Seriously, 49 cents a piece for 2" x 2" off cuts. First, cut the 2" x 2" board into two 2-foot lengths; starting at the ends of the boards, mark with a pencil approximately 1 1/2 to 2" from each end. Then mark 2 or 3 points along the board equidistant from the two marked points at the ends of the boards. (I chose to mark only 2 points, which would give me a total of 4 clotheslines per display.) The image above crudely illustrates these instructions. Then, using the smaller bit, drill through the hole you just made and through the board entirely. Why are we doing this? To countersink the knots we'll be making later. If you don't care if the knots show, you'd only have to drill the smaller holes. Now it's time to sand and prime and paint, OR stain and varnish, OR apply Dutch oil. Notice the difference in hole size in the picture above. The larger holes will be pointing to the ceiling and the bottom holes will be pointing to the floor when the structure is completed. The small holes will be facing each other when the structure is completed. Note how in the image above the knots are on the side of the boards with the LARGER hole openings. This is imperative for the knots to countersink and disappear below the surface of the boards. Attach a sawtooth picture hanger at the center of one of the 2" x 2"s. I would also STRONGLY recommend attaching two sets fo 3m Command Large Picture Hanging Strips on each end of the top piece of wood and one at the center of the lower piece of wood. This will keep your clotheslines secure, as you don't want them swinging back and forth when attaching photos. It's finally time to attach your favorite snaps with the small clothespins. And look, take a peek at the new bookcase arrangement. To see the rest of the office (aka: the reveal), come back next Tuesday. And to see the other posts in this series, check out part 1, part 2, and part 3 too. 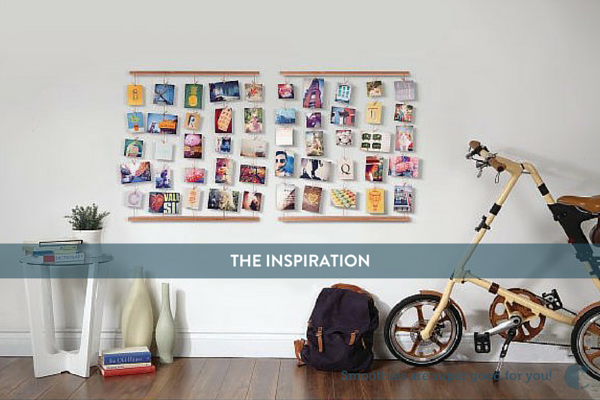 I have something similar but a LOT simpler that I use to display photos most of the year, Christmas cards during the holidays--it's just a grid of clothespins stuck to the wall with 3M stickies.